Relatively little is known about the effectiveness and use of community-based child protection mechanisms (CBCPMs) and their alignment and linkage with formal aspects of wider child protection systems. This gap in knowledge about CBCPMs is problematic since an understanding of the use, effectiveness, and sustainability of CBCPMs is essential for improving practice and policy in regard to strengthening child protection systems. To address this knowledge gap and to help strengthen policy and practice around child protection, the Interagency Learning Initiative is implementing action research in Kenya. 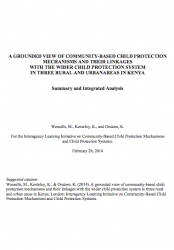 The first stage of the research, which is the focus of this report, involves systematic learning about existing CBCPMs in Kenya and their linkage with formal, government led aspects of the wider child protection system. This research was conducted in 2011-2013 in Mombasa and Kilifi in the Coast area, and Kisii in Nyanza area. The findings from the three sites are presented in this report and recommendations are offered. Author(s): Wessells, M., Kostelny, K., and Ondoro, K.